Once in a while, when searching through antique stores looking for old pens, something truly wonderful turns up. Much of my antiquing happens in New England and as a result, I encounter a lot pens with origins from the area from north New Jersey to Boston. Over the years, I've found Moore pens, a Crossman pen, many Mabie Todd pens, quite a few Waterman pens and lots of Wearevers. 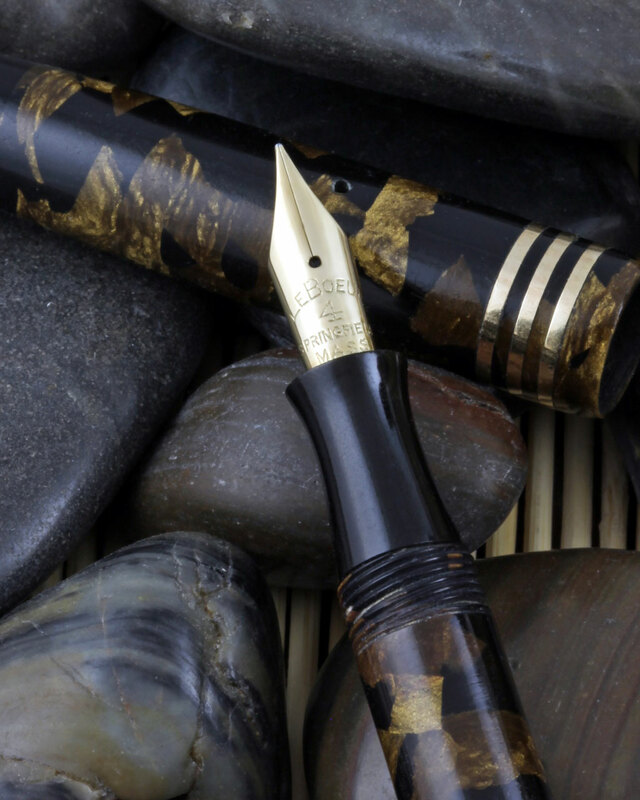 On a recent trip I spotted this very attractive brown and black marble ringtop pen and saw an imprint and nib stamping I had not previously encountered in the wild: LeBoeuf. Of course, I snapped it up! The LeBoeuf Fountain Pen Company incorporated in 1921 at 49 Arch Street, Springfield, Massachusetts, and by 1922 had 25 employees. The company had a fairly short life, filing for bankruptcy in 1933. LeBoeuf's legacy among collectors stems from two factors. 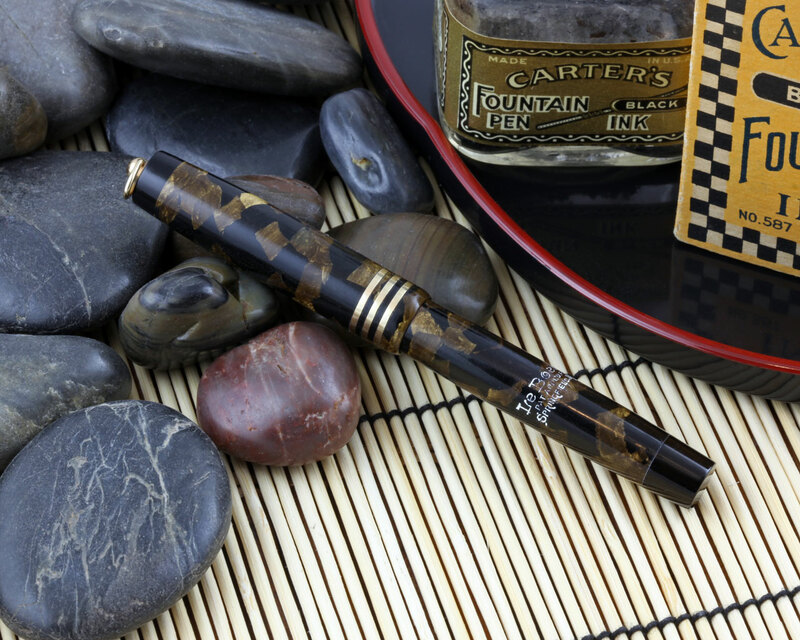 The company was a pioneer in the use of celluloid for pen caps and barrels at a time when the majority of fountain pens were made from hard rubber. 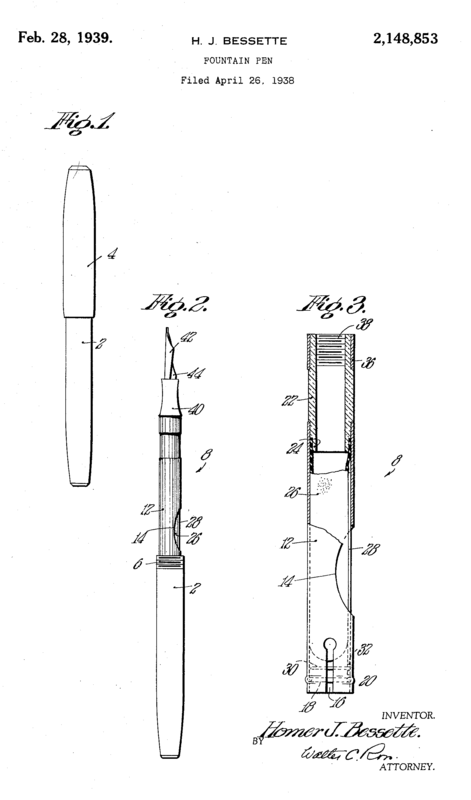 LeBoeuf's first patent, US 1302935 A, published May 6, 1919, was an idea for making pen barrels and caps using celluloid tube. The patent's innovation was to use celluloid instead of hard rubber because hard rubber is "very susceptible to cracking and breakage due to other causes, while celluloid possessing more resiliency and elasticity, is less liable to breakage." Making the pen parts from celluloid tubes eliminated the possibility of a leaky seam and also avoided drilling out a solid block. The patent further describes the pen barrel being kept watertight by fixing a threaded rubber washer on the barrel end. LeBoeuf marketed their pens as unbreakable, a claim literally reinforced by the insertion of a metal sleeve in the barrel to add strength to the celluloid tube. 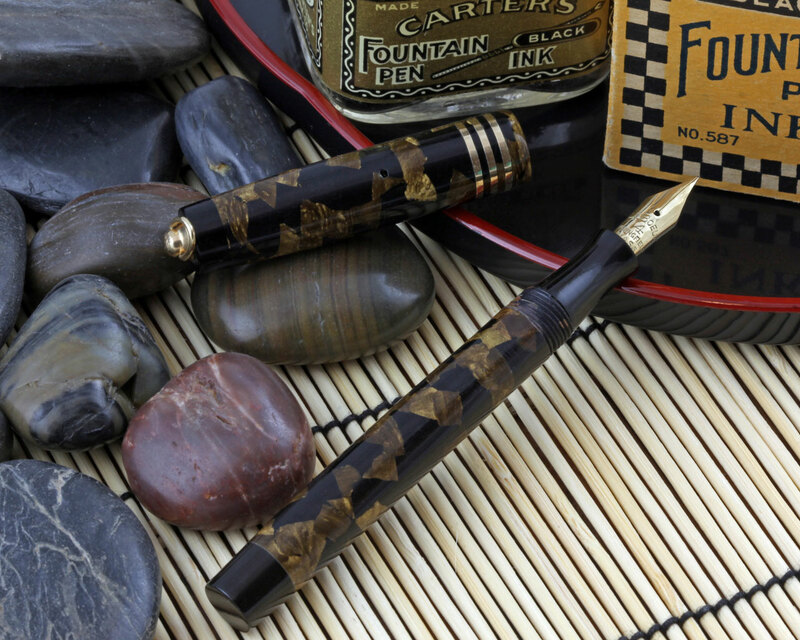 Early LeBoeuf pens were lever-fillers and were offered in many dazzling celluloid patterns, some of which may have been unique to LeBoeuf. There is some dispute as to when, but around 1931, LeBoeuf introduced a sleeve filling pen, also called by collectors a "thumb filler". The pen fills by pulling open the barrel at a split in the middle, to reveal a metal sleeve with an oval cutout. There is a press bar in the cutout that directly presses the ink sac, allowing the pen to fill. Essentially, it's like a lever filling pen without the lever, with your thumb doing the work. Many modern pens, including the Parker 51 and converters operate in this same way. Some time later, though before the company went bankrupt, LeBoeuf introduced a new version of the sleeve filling system where the barrel pulls down from a break at the section. The internals operate the same way, press the bar to fill the pen. Interestingly, in one of the patents, LeBoeuf describes the sleeve with the press bar and sac as an improvement that allows for the pen to be serviced more easily by the dealer and without having to return the pen to the factory. I would wonder what pen repair experts today would think of that claim versus a sac replacement job on a standard lever fill pen. Without catalogs or advertisements to work from, it's difficult to pin down the dates for this pen. I'm going with c1932 based solely on secondary references, patent timing and order, and the bankruptcy of the company. I do not have materials to show pricing, model or even finish names, unfortunately. 14 karat gold number 4 nib marked "LEBOEUF" over "4" over "SPRINGFIELD" over "MASS"
Barrel imprinted "LeBoeuf" over "PAT. APPL'D FOR" over "SPRINGFIELD, MASS"
This is a surprisingly beautiful pen considering that the celluloid is a more subtle than usual color for a LeBoeuf. The pen is a little heftier than expected, weighing about .7oz, likely due to the metal hardware inside. The triple cap bands and heavy ringtop compliment the pen. The whole pen says high quality. Showing just how "unbreakable" this pen is, the section thread shows a crack where the metal sleeve can be seen. Strong pen! It's a small pen in the hand, and the filling mechanism is easy to work. The barrel pulls back with a little effort - some lubrication is in order - and reveals the filling mechanism. As it has not been restored, I've only water filled it, which is very easy done by pressing the filler several times and waiting for the sac to fill. It still manages to do a good job. I would probably send this one out to be restored. The nib is a firm semi-flex fine and writes a nice wet line. It, too could use a little adjustment as it "sings" a little, but it's fun to dip and write with. In the hand, like most ringtop pens, it's a bit small, even with the cap posted, but larger and longer than many. 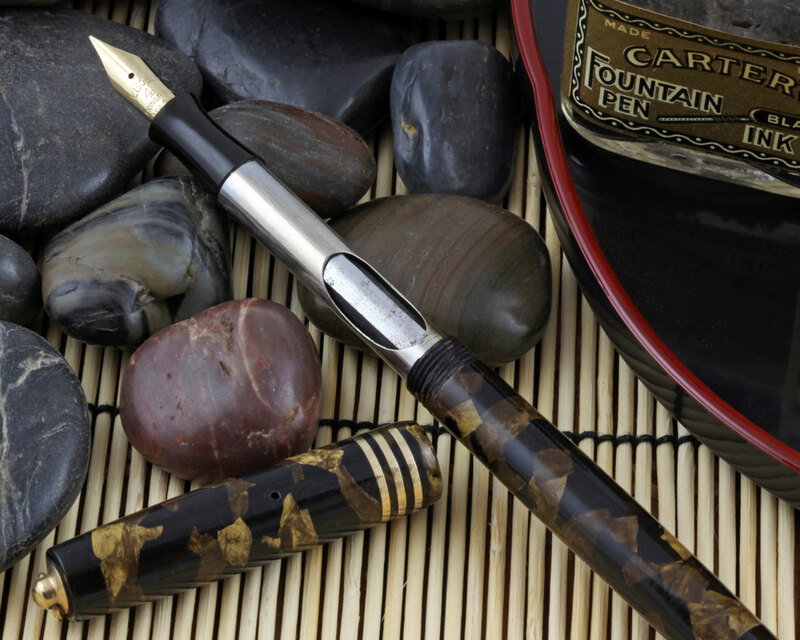 The barrel is slender, but a little bigger than many other ringtop pens. I would find it more comfortable to write with it posted. 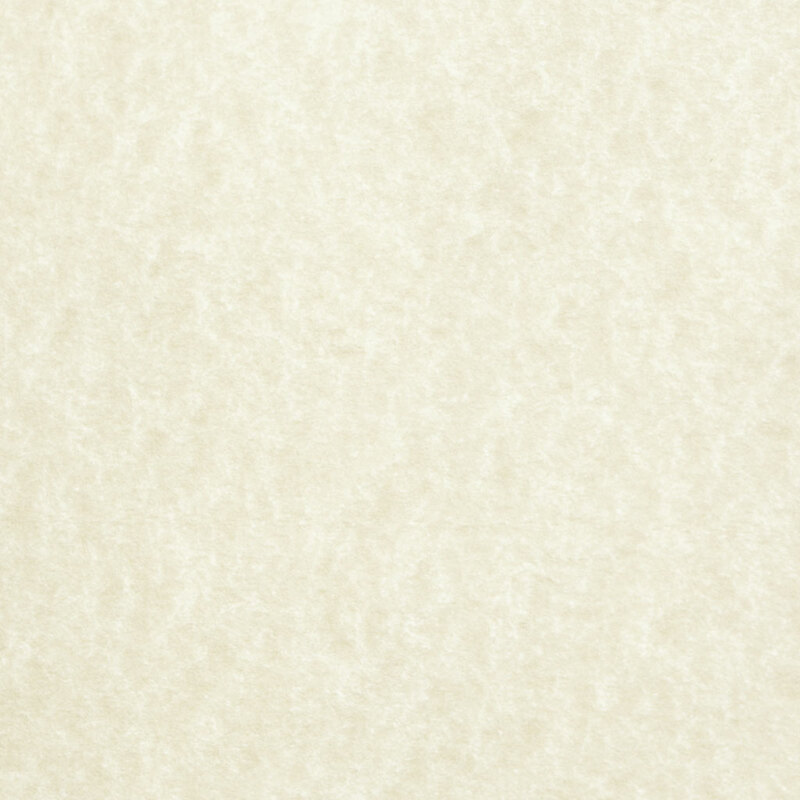 LeBoeuf pens are not common, and the sleeve filler pens are less so. They often claim high prices, especially the full size pens that use exotic looking celluloids. There are collectors who focus on LeBoeuf, and considering market prices, a large collection would be a commitment indeed. How nice to find this gem among pens in my antiquing! © Copyright 2015 Jim Mamoulides / PenHero.com LLC. All Rights Reserved.